My novel of early printing has appeared in beautiful dress on both sides of the Atlantic, and foreign editions coming next year will offer other feasts for the eyes. But one binding, it must be said, trumps them all. I received it while on tour in California, thoughtfully swaddled in bubble wrap and pre-packaged for the journey home. Flush from a wonderful literary lunch at the Montalvo Arts Center, I was utterly unprepared for the extraordinary objet de luxe I would unwrap. 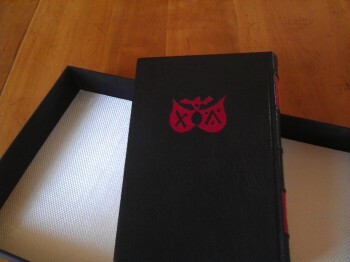 Like the novel, it’s a kind of Bible in a box. 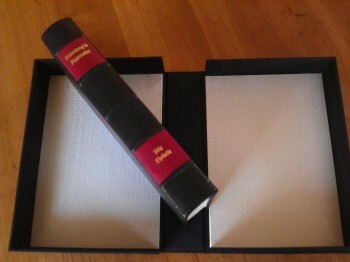 The box containing this unique copy is covered in black moiré and sectioned to open flat onto textured white linen linings that feel equally ecclesiastical. 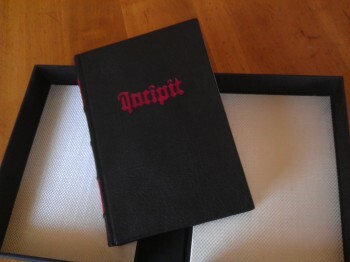 The book itself is bound in full black leather with raised cords along the spine; its title and author are stamped in gold textura letters on that spine, on inlaid leather squares of ruby red. In the hand it feels exactly like a finer version of a Bible or pocket encyclopedia that once held pride of place in many homes. What most brought tears to my eyes, though, were the designs that Peggy also tooled in red on the front cover and the back. The front reads “Incipit” in Gutenberg’s own letters, Latin for “Here begins”—a sentiment that applies as much to my own writing life as to every book of Scripture. The back cover features the beautiful double shield that was Peter Schoeffer’s printer’s sign, and for many years the emblem of the Frankfurt Book Fair. In the hand the book is elegant, compact, with ivory endpapers of Fabriano Roma that blend perfectly into the subtle, handsome pages of the Harper hardback. It should come as no surprise that I think books are for holding, and the better ones will hold through time. 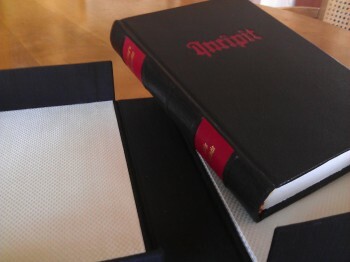 The Gutenberg Bible certainly did—and in its own modest way, my beautifully bound new book promises the same. I’ve said it before and I’ll say it again: you only get to be a debut author once. It has been a marathon, but from the start I was determined to enjoy the ride. Author tours are a rare privilege these days—so every stop was a gift (though I might have skipped the 200-mile round trip on a rainy Saturday for a half-dozen hardy souls). Above all, the three weeks I spent on the west and east coast of America reaffirmed my faith in readers and books; everywhere I went, audiences were keen to talk about the meaning of books today, print or digital, and learn more about the story of the first printed book my novel tells. What blew my mind most, though, were the many moments of serendipity and staggering coincidence. My very first event was at Book Passage, one of the most dynamic bookstores in the San Francisco Bay Area. As a parting gift, event manager and book artist Melissa Cistaro gave me a tiny volume she’d found scouring used book sales: one of the famous thirty miniature Christmas Keepsakes printed by AR “Tommy” Tommassini between 1947 and 1977, which my grandfather Les Lloyd collected. This one was titled “Pages from the Gutenberg Bible in miniscule facsimile,” but that wasn’t the only thing that stopped my heart. That very afternoon, I had received an email out of the blue from a stranger who’d picked up a copy of my grandfather’s book about Tommy’s collection, called “Thirty Plus One” and wanted to know more about it. 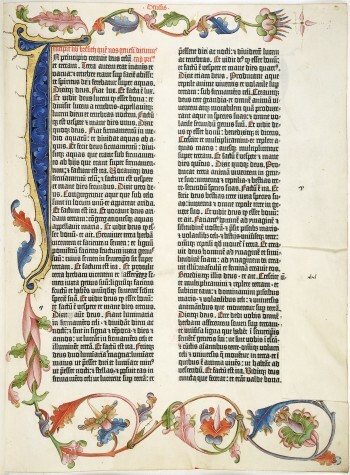 Every now and then a leaf (a single two-sided page) from the Gutenberg Bible turns up for sale at auction. I was recently asked if I would buy one, if I had the cash. As it happens, I—and the rest of you—have a chance to put that question to the test next week. At New York’s Swann Auction Galleries on Oct 21st, a single page from the Acts of the Apostles printed on paper will be offered for a guide price of between $40,000 and $50,000. (A similar leaf went last year for $55,200). This new leaf (pictured) has two handsome blue and red illuminated initials; I’d dearly love to know from which original copy of the Bible it comes. The history of these so-called “Noble Fragments” may give us a clue. In the 20th century, two different owners dismembered what they believed to be incomplete copies, and sold them leaf by leaf. The Gutenberg Bible is usually bound in two volumes, sometimes three. The dealer Gabriel Wells took apart a lone Volume II in 1921; Charles Scribners Sons did the same to a different Volume II in 1953, according to the Museum of Biblical Art. There was only one problem. Scribners’ volume was not in fact ‘incomplete’. It had merely been separated by historical misfortune from its companion Volume I, later discovered in Mons, Belgium. The illumination of the leaf offered in New York differs from both the Wells and Scribners “Noble Fragments,” which MOBIA has reproduced here. Maybe it matches some other copy preserved in part, or one of the 130 or so lost to posterity; sharp incunabulist eyes and search engines will surely know. So much that went missing during the second world war has turned up in recent years, with scholars exchanging news and digital views online. I’m not a collector, myself. But even if I were, and could afford it, I wouldn’t buy a piece of something that belongs to something else. It’s a little bit like paying ransom: when there’s money to be made, the abductions start. 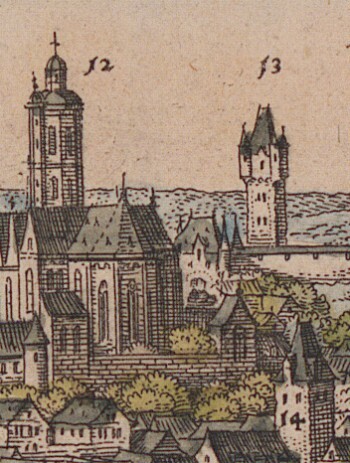 Books have been bought & sold in Frankfurt since the 11th century. 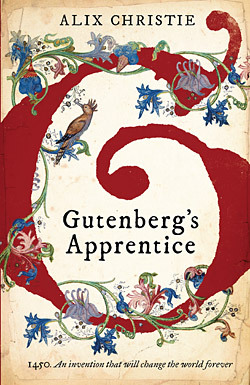 But the Buchmesse opening there today owes a special debt to Gutenberg’s apprentice. Exactly 560 years ago this month, the first printed book appeared in the Leonhards Lane near the banks of the River Main. This monumental volume, which launched the last great media revolution, is known as the Gutenberg Bible. Manuscript books had been sold in Frankfurt since the trade fair’s beginnings in the 11th century. But the book that appeared that October half a millennum ago was startlingly different. It was written not by a scribe with a quill or a reed, but produced by a marvellous new technique. This enormous volume of 1282 pages had been printed on paper and vellum using a modified grape press, sticky oil-based ink and cast metal type—and it was in Frankfurt that it was first glimpsed by an astonished world. 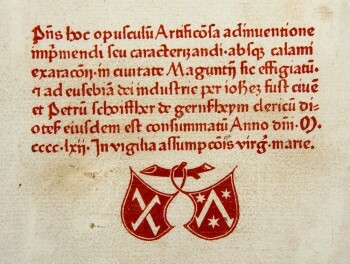 The future Pope Pius II, who was secretary to the Kaiser of the Holy Roman Empire at the time, enthused to a Spanish cardinal that the book’s letters were so large and clear “you could read them without your glasses.” The whole press run of some 180 copies was already spoken for, he wrote. He had seen the book in Frankfurt that October of 1454, presented by a “miraculous man”—almost certainly the inventor of printing with moveable type, Johann Gutenberg. Yet innovation, we now know, is rarely the work of one lone genius. 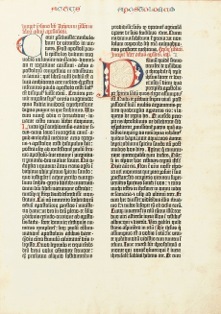 Gutenberg did not change the course of history alone. Without two other men long left out of the history books, that Bible would never have appeared. One was Johann Fust, a Mainz merchant who advanced the inventor his venture capital. The other was Gutenberg’s apprentice, Peter Schoeffer, who became the world’s first major printer and the chief founder of the Frankfurt Book Fair. The thousands of publishers, booksellers, agents and authors crowding the congress halls of Frankfurt today might spare a moment to reflect on the seismic change these three men brought about. 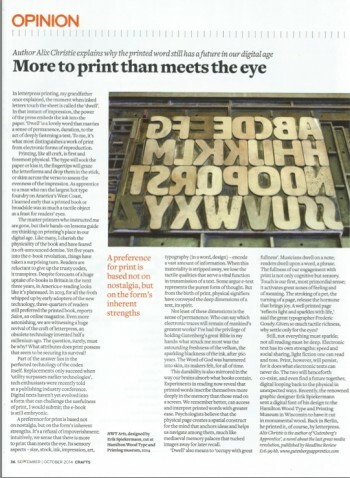 The world’s first tech startup holds many lessons for the digital revolution that is disrupting the world of print the way the press did five centuries ago. Take a walk in Peter Schoeffer’s footsteps: he’s your spiritual ancestor. He and Fust founded a printing firm after their acrimonious parting from Gutenberg; over his lifetime Schoeffer produced nearly 300 books, inventing the title page, the sales catalogue, and the business of publishing itself. 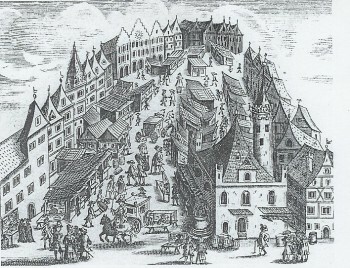 In 1462, the firm moved to Frankfurt, where Schoeffer led this nascent market in printed books. For more than 500 years, the printers’ signet of his printing house was used as the logo of the Frankfurt Book Fair. The “Author Feast” at the Pacific Northwest Booksellers Association conference initially reminded me of that scene in C.S. Lewis’ Narnia book “The Silver Chair” in which the hapless humans stumble on a giant’s cookbook opened to the recipe for “Man”. Who would be feasting on whom? In the event, the evening was a blast. Twenty hardy authors rotated from table to table, in the book world’s version of speed dating: for 15 minutes per table we talked about our books, then a gong sounded, and we moved onto the next. Luckily we each only had to address six tables of 12 booksellers, or our voices would have given out. Fellow author Blaine Harden, whose book on an extraordinary chapter in North Korean history comes out in the spring, said it was the most grueling author experience he’d had – and this from a longtime foreign correspondent used to traipsing all over Asia and Africa. 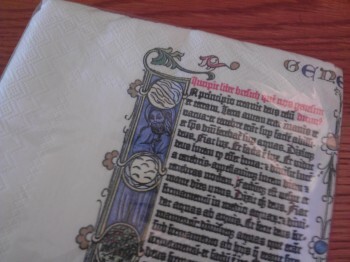 I didn’t bring my Gutenberg Bible napkins, more’s the pity. (These choice items are for sale at the Gutenberg Museum in Mainz, and are a fabulous addition to any “Gutenberg’s Apprentice” party you may plan.) 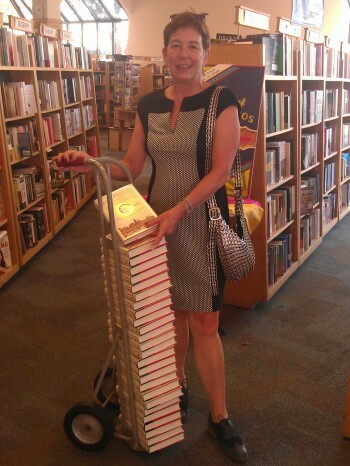 But I was gratified by how seriously the booksellers tucked into my tale. It helps that I have a gorgeous hardback they all ooh and ahh over. But more than that, the story of the invention of printing is both compelling in its own right, and seemingly irresistable to people deeply steeped in the world of books. It was incredibly heartening to learn that my novel was of tremendous interest to many. One independent bookstore owner, a tall gentleman with flowing white hair and a Stetson, told me afterward that throughout the evening he’d heard about a whole lot of books he wanted to stock on the shelves of his store—but mine was the only one he really wanted to read. A feast of an evening, indeed. 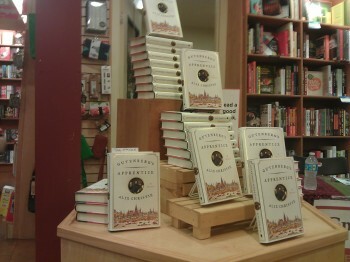 There’s nothing to compare to the sight of your own book in an artful pile in a bookstore. Copperfields in Healdsburg, California, built a book berg last week as I swung through the San Francisco Bay Area to promote “Gutenberg’s Apprentice.” It was like a French wedding cake, with people plucking off pieces; by the end there were only crumbs. Everywhere I went, this gorgeous American hardback, glinting on tables and bookshelves, caused people to drool. One sensational event followed another: SF Center for the Book, Villa Montalvo, Booksmith@Arion Press, and talks at both my alma maters. I am gobsmacked (to use a choice British expression) by how interested everyone is in this arcane topic I’ve been pickling in for the past seven years. The most rewarding part by far is hearing those who’ve read the book talk about the things that meant a lot to them in it. Some said it was the immersion in the sights and smells of the Middle Ages; some the coming of age story of the young apprentice. One radio interviewer said I’d written ‘science fiction with a tech twist’ because I’d successfully recreated an entirely alien world. Every reader will find something particular to themselves, and that is the beauty of stories. Amazingly, I find that I am able to speak to large groups without fright, energized by their interest and delighted to share what I’ve learned. All the strange little anecdotes I’ve tucked away bubble up as jokes: the way Gutenberg was fined by a judge for his foul mouth, the way the printers soaked their ink balls in urine to keep them supple overnight; the gorgeous three-color printing that showed Peter as a master just a few years afterward. At readings, the questions range from the large sweep of history to the little, documented details. I’m thrilled to be able to share it all. At the very beginning — exactly a year ago, when my brilliant agents first sold this novel — someone told me to hold onto my hat and enjoy the ride. I’m enjoying it immensely. After all, I only get to be a debut author once. 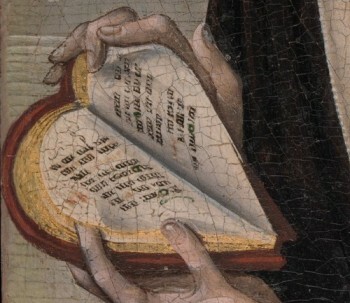 In the beginning was the Word, wrote John. All of us who cherish language and stories and words can surely agree, whatever our religious inclinations. The beautiful page at left also starts with these three words. “In the beginning.” It’s the opening of Genesis, in the mighty Biblia latina finished in Gutenberg’s workshop in autumn 1454. I find it a fitting illustration for my own beginning–for today marks the official publication date of “Gutenberg’s Apprentice” around the world! A red-letter day it is indeed. I hope to see many of you at 7 pm tonight at Book Passage in Corte Madera, or at any of my other events in San Francisco, Portland, Seattle, the eastern seaboard and Great Britain. They’re listed here under “Events”. I set out now upon my “Wander Years,” a journeyman carrying my tools out in the world. In the nicest twist of fate, the time it took for this book to appear today was seven years–the exact length of an apprenticeship in a medieval guild. Very pleased to share this piece that has just appeared in the 250th anniversary issue of the British magazine Crafts, Sept/Oct 2014. It’s a gorgeous issue, run out and buy it!! I write this not (just) to blow my own horn. (It’s a fact of modern life that authors, no matter how private, must blow not only their own horn but an entire brass section, in person and over social media.) 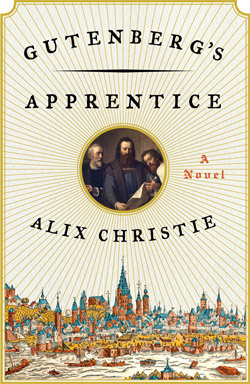 Rather, it’s that her comments caused me to reflect more deeply on two things: what writing “Gutenberg’s Apprentice” has meant to me, and how it will feel once the novel is out in the world. I think it’s safe to say there are probably only a handful of people with the precise mix of interests and skills to undertake such a project. I could not have written this book if I didn’t speak French and German, and was a printer myself. It has, from the beginning, been a labor of love, a treasure hunt whose every twist and turn was absurdly exciting. I had tried to write novels before, with limited success, but this was the one that gripped me and would not let me go, the one I was born to write. How it is received is something else. My passion for the subject is mine; some readers will share it, others not. It has been enormously encouraging to receive starred reviews from the industry’s three major trade magazines: Publishers Weekly, Kirkus Reviews and Booklist. It has also been instructive to read the early reviews online, and realize that no single novel can hope to please all of the people all of the time. I’m gratified that a majority of early readers have been moved by Peter Schoeffer’s story. More than that I cannot ask for. One of the many wonderful things about San Francisco is the way that new technology and old can sometimes co-exist. Like my website—built, I am proud to say, aboard a boat floating in San Francisco Bay. There are hazards, I’m sure: once a storm knocked out the T-1 line overnight. But my designer’s berth on the East Bay shoreline helps me feel connected to my home city every time I log on. Connecting is the whole reason I built the site in the first place. Like any proud parent, I wanted to share every little thing about the new being I had brought into the world. More than anything, I wanted readers to see the beautiful images that had helped me to really envision the medieval world of Mainz, and the exquisite leaves of the Gutenberg Bible. I think of these images as a gift—a gift I would in no way have been able to offer without the support of the fantastic libraries in which they are housed.